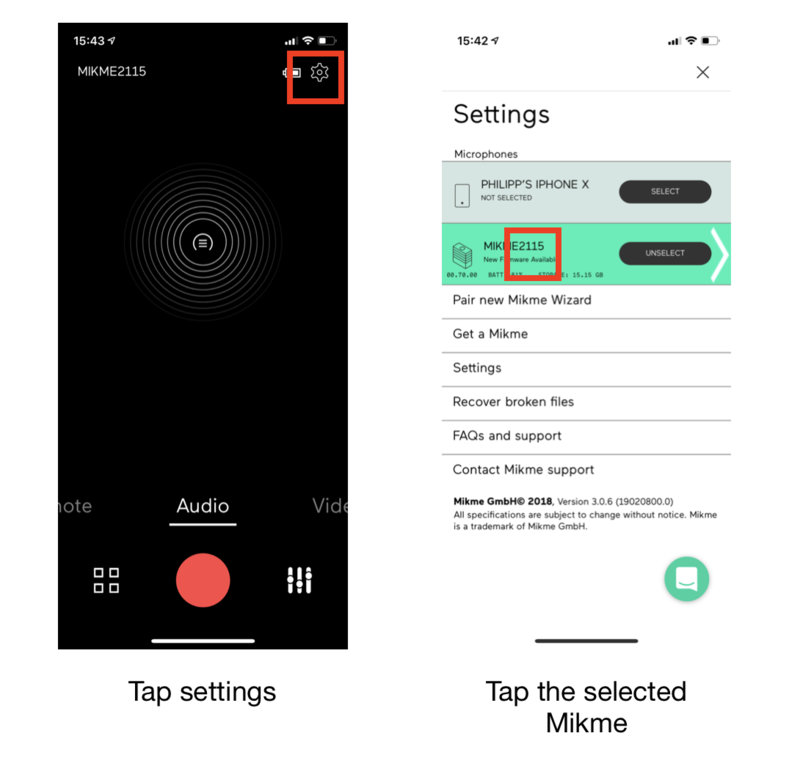 Learn how to update the Mikme OS (software/operating system/firmware) of your Mikme Microphone. 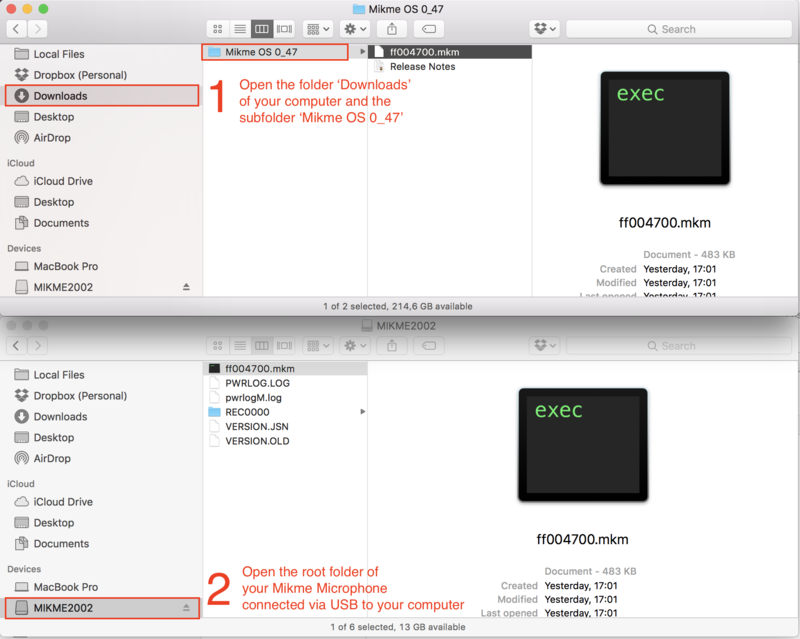 If you have a version LOWER than 54.04 you'll need to update your Mikme manually via USB. Please proceed to section "B". 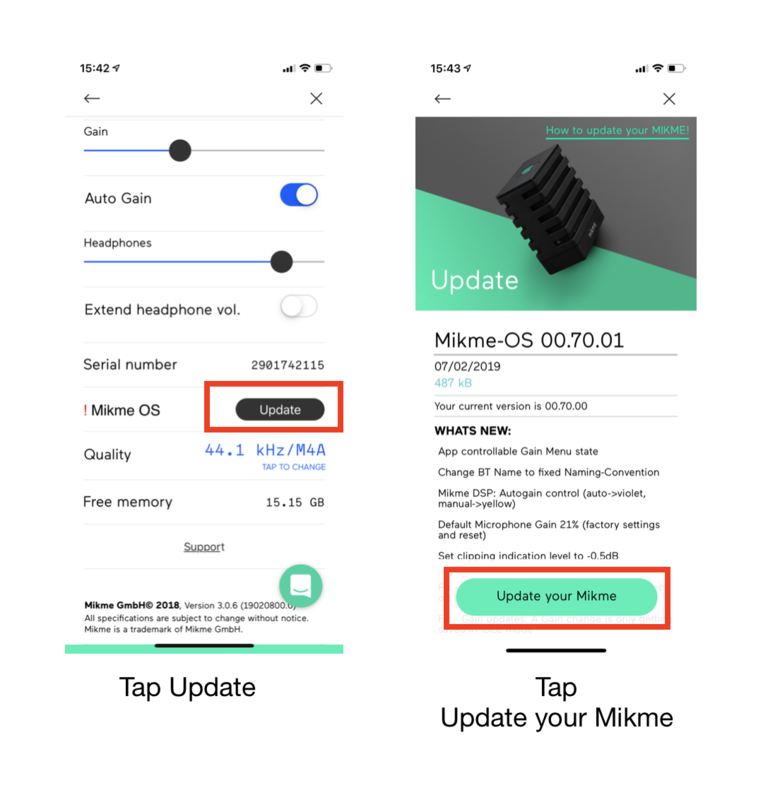 To check the version number of your Mikme please open the settings in the App or connect Mikme to a computer. See the full article "How to find the version" here. You'll see an "Update" button next to the "Mikme OS" entry. --> Your Mikme is on the latest Mikme OS version. You are good to go. Tap the "Update your Mikme" button to start the update. The app will now automatically update the Mikme. The top LED of the Mikme will flash green and blue while the update is active. Wait until the update is done (the top LED of the microphone flashes white after completion). Mikme restarts automatically and reconnects with the Mikme App. Now you've successfully updated the OS of your Mikme Microphone. DO NOT disconnect Mikme at any time while updating. Optionally backup your recordings by copying all files from your Mikme Microphone onto your computer (Learn how to access your files here). Unzip the file Mikme OS 00_70_04.zip you just downloaded. Connect your Mikme with the USB cable that came with your Mikme to your computer USB port. Turn your Mikme Microphone on (push the Power button on the left rear side of your Mikme for a second). Mikme's top capture LED will flash orange (it can take up to 10 seconds until the top capture LED flash orange). You should see the Mikme mounted as an external storage on your computer's file explorer – it can take up to 10 seconds until the top capture LED flash orange. Open the Mikme Microphone's root folder. The root folder is the main folder you see if you click on the connected Mikme at your computer's file explorer. to the Mikme Microphone's root folder. Eject Mikme from your computer (use the eject button of your computers file explorer). DO NOT just unplug the USB cable that connects Mikme with your computer. Now Mikme will perform the update — it takes about 1 minute. The top LED of the Mikme will blink blue and green while the updating. Wait until the Mikme restarts automatically. If the top LED of your Mikme is steady white or orange again, you've successfully updated the OS of your Mikme Microphone. You can start capturing your next masterpiece.